Apple has added a new channel to its Apple TV set-top box called "Apple Events" that will live stream the company's media briefing today. In addition, the event will also be streamed to iOS devices and Macs. Users are invited to tune in at 10 a.m. Pacific, 1 p.m. Eastern to watch the "Apple Special Event" live. The presentation will be held at the California Theatre in San Jose. In addition to a live stream of the event, Apple TV users can also watch Apple's other presentations, including the iPhone 5 unveiling, the 2012 Worldwide Developers Conference, and the introduction of the third-generation iPad with Retina display. Streaming via Apple TV requires a second- or third-generation model with software 5.0.2 or later. For those on a Mac, the live stream requires Safari 4 or later on OS X 10.6 or later. On iOS devices, Safari on iOS 4.2 or later is required. The stream will be made available on Apple's website. 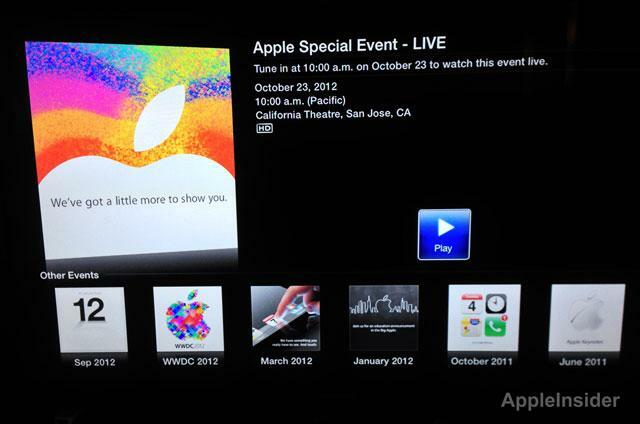 Apple has on occasion offered live streams of its events, most recently in September of 2010. However, those events were streamed to Mac and iOS devices, not the Apple TV. A week ago, Apple sent invitations to members of the press inviting them to see "a little more." The company is expected to introduce a new, smaller iPad with a 7.85-inch display. Also potentially on tap today are new Macs, most prominently a new 13-inch MacBook Pro with Retina display. The company may also introduce a new version of iBooks, and a revamped version of its iTunes desktop software. AppleInsider will have full, live coverage of today's event.